Sat., 27 Jul. - Sun., 4 Aug. Situated in Chelyabinsk, this hotel is 1.7 mi (2.7 km) from Chelyabinsk Aquarium and within 6 mi (10 km) of Kirovka Pedestrian Street and Church of Holy Trinity. Children's Philharmonic Hall and Prokofiev Concert Hall are also within 9 mi (15 km). 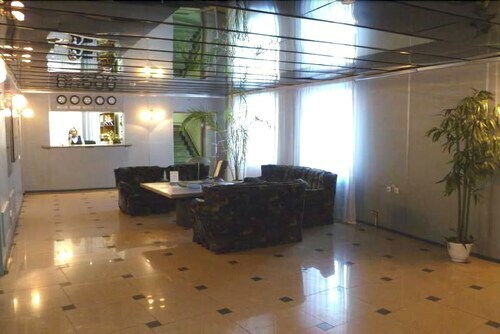 Situated in Chelyabinsk, this hotel is 2 mi (3.2 km) from Chelyabinsk Aquarium and within 6 mi (10 km) of Kirovka Pedestrian Street and Church of Holy Trinity. Children's Philharmonic Hall and Prokofiev Concert Hall are also within 9 mi (15 km). Situated in Chelyabinsk, this hotel is within 3 mi (5 km) of Museum of History of Labor Glory, Palace of Culture CTZ, and Shadow Theatre. New Arts Theater and CTZ Museum are also within 3 mi (5 km). 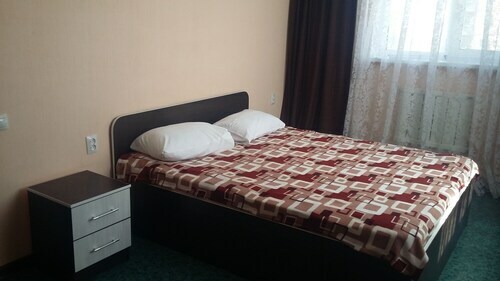 Situated in Chelyabinsk, this bed & breakfast is 0.4 mi (0.6 km) from Museum of History of Labor Glory and within 3 mi (5 km) of Kirovka Pedestrian Street and Church of Holy Trinity. New Arts Theater and Chelyabinsk Contemporary Dance Theater are also within 3 mi (5 km). 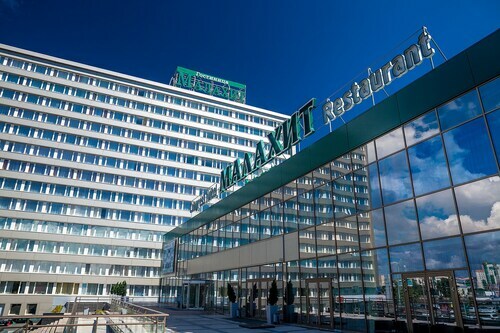 Situated in the entertainment district, this spa hotel is within a 5-minute walk of Chelyabinsk State Museum of Local Lore, Kirovka Pedestrian Street, and Prokofiev Concert Hall. Chelyabinsk State Museum of Fine Arts and Glinka Opera and Ballet Theater are also within 10 minutes. This family-friendly Chelyabinsk hotel is located in the business district, within a 5-minute walk of New Arts Theater and CTZ Museum. Kirovka Pedestrian Street and Palace of Culture CTZ are also within 1 mi (2 km). Located in the heart of Chelyabinsk, this hotel is within a 10-minute walk of New Arts Theater, CTZ Museum, and Palace of Culture CTZ. Shadow Theatre and World Trade Center Chelyabinsk are also within 1 mi (2 km). Situated in Chelyabinsk, this spa hotel is 1 mi (1.6 km) from Children's Philharmonic Hall and within 3 mi (5 km) of Traktor Ice Arena and Kirovka Pedestrian Street. Church of Holy Trinity and Prokofiev Concert Hall are also within 6 mi (10 km).